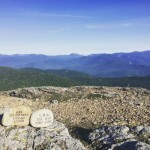 Kirsten White, Catherine Gordon, and Kristin Stelmok carried the stones and the stories of SGT Nicholas Robertson, and SGT Christopher Wilson up two mountains in Maine over the summer of 2015. They were honored to share these stories and ensure that Maine Heroes are NOT Forgotten. 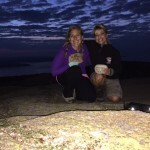 My name is Catherine Gordon and I carried Christopher’s stone on a nighttime hike up Cadillac Mountain in Acadia National Park. 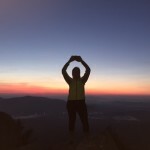 As Kirsten and I had hoped, we made the summit in time to see the sunrise. 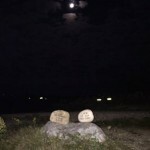 We placed our soldiers stones so that they would have the perfect view. What a stunningly beautiful moment it was. It was a moment where thankfulness washed over me that I was there able to take it all in, but also sadness that Chris wasn’t there to see it….. although I think maybe he was in a way…. I am so sorry for your loss. I hope that I can live a life worthy of Christopher’s sacrifice. I may have only carried his stone for a day, but I will carry his story in my heart forever. Maine heroes are not forgotten. 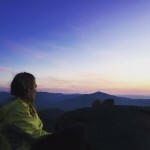 One week ago today I woke up at 2:00 AM to catch the sunrise on a ten-mile traverse of the Moat Mountains of New Hampshire. 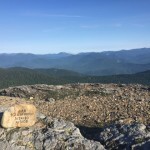 This hike was special for two reasons: it was my first Summit Project hike, and my hiking partner was one of my oldest and dearest friends (and Summit Project board member) Kirsten White. The hike itself was beautiful – the sky was clear, the breeze was warm, and the White Mountains spread out endlessly in front of us. What made the day most meaningful, though, were the stories we told each other. We tried, in ten hours, to fill each other in on the past twenty years of our lives. We also talked a great deal about the lives of “our” soldiers (Sgt. Christopher Wilson and Sgt. Nicholas Robertson), their sacrifices, and those they left behind. As a teacher and scholar of literature, I look to books and to stories to help make sense of the world. Stories help us understand people whose experience of life may seem vastly different from our own. Stories help us make connections across time and great distances. Stories are how we share our lives, and telling stories is what makes us human. Sgt. Wilson’s stone is a metaphor for the gravity of his sacrifice, and holding it felt solemn and humbling. But the stories I read about Sgt. Wilson made his life, and thus his sacrifice, even more real to me. I learned that Chris Wilson had a strong bond with his sister. I learned that he loved his daughter and worried about not being there for her as she grew up. I learned that he loved cooking and that he was a fiercely loyal friend. Hundreds of people left messages on his legacy page, and I read all of them. Chris Wilson had a relatively short life, but he made a great impact on those who knew and loved him. Carrying Sgt. Wilson’s stone was an honor and a deeply meaningful experience. 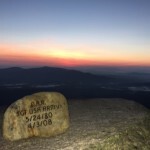 I hope to carry his stone again and to have the chance to tell more people about the Summit Project and its mission. I won’t forget Chris Wilson, and I’ll keep telling his story.